We’ve seen some awesome collector’s editions and limited-edition PS4 bundles released over the years, but we wanted to give even more to the PlayStation Nation. This year we’re very excited to introduce ‘Extraordinary Bundles of Greatness’. We’ll be bundling a PS4 system and game together with an awesome over the top prize to truly make the bundle Extraordinary. We’ll be making ‘Extraordinary’ versions of your favorite bundles throughout the year, so make sure to keep checking with PlayStation.Blog to see the latest and greatest. First up: a shot at winning our exclusive Batman: Arkham Knight PS4 ‘Extraordinary Bundle’, which includes the Limited Edition console, a copy of the critically acclaimed Batman: Arkham Knight from Warner Bros Interactive Entertainment, and a custom Batmobile inspired by the one in the game. That’s right — a custom Batmobile, built for one lucky winner by the experts at Super Fan Builds. To enter the sweepstakes for your chance to win, just snap a photo of yourself with the new Batman Arkham Knight PS4 bundle and tweet it out with the hashtag #PS4BundleSweepstakes. You can check out the full sweepstakes rules right here to learn more. Are you serious? Whatever happened to the limited edition that came with the Batmobile that got cancelled at the last minute? Angering a lot of fans that preordered the game. Is this a scam? I want a bundle with 2 TERABYTES HARD DRIVE !! Just buy a hard drive. It’ll be cheaper too. The following Promotion is intended for viewing in the 50 United States D.C. and Canada (excluding Quebec) only and is construed and evaluated according to California law. Do not enter this Promotion if you are not a legal resident of, and located in, the 50 United States, D.C. or Canada (excluding Quebec) at the time of entry. If someone has the money to buy the standard bundle (C$499.99) and the limited edition bundle (C$549.99) with additional provincial tax (e.g. Ontario=13%;Quebec=15%), good luck! Just get a pic with the box at a local game store. I mean, if the prize includes the console and game as well, seems kinda pointless to already have to OWN it. No purchase necessary, after all. So basically you need a batman bundle to enter to win a batman bundle. Will a picture with a picture of a bundle work, cause that’s the only way for some one with ps4 can enter. Couldn’t help but notice you didn’t say anything about BUYING the bundle, just that you need to take a picture with one. EB Games, here I come! Well, Donkey, at least the EB Games here that were changed to Gamestop ended up being rebranded back to EB Games withi a year. Still goes by EB Games in Canada. Mail Entry: To enter via mail, send in a postcard with your full name and email address to “Extraordinary Bundles of Greatness: Batman Arkham Knight Sweepstakes”, Prize Logic, 25200 Telegraph Road, Suite 405, Southfield, Michigan 48033. Mail-in entries must be received by Prize Logic by July 13, 2015 9:00 PM PST. Mail-in entries sent in an envelope will not be accepted. Mail-in entries must be original and hand-written. No mechanical reproductions are allowed. 1 postcard constitutes 1 entry. This is awesome!!! I’d love a batman bundle even, sadly I can’t afford it. Lost my job and can barely make rent at the moment. I always miss out on the good stuff, haha! 8. it a real car.. That you can drive from understanding it cost around 1-2 million to make a batmobile. Insurance is not the real issue you can use your current, its the car owner ship luxury state tax that will do the whipping on your wallets . The last guys to own one the 1stone, He had to pay to 25k a year. oil change was 10~20k thousand dollar., I kid u not..I think he ended up selling it after 2-3 years.I don’t know how much he sold it for.. But you cant beat owning batmobile regardless of cost to maintain. I always wanted the 1st one and second movie one. The Batman, this infamous pursuit and capture vehicle has earned its reputation as the apex predator on the mean streets of Gotham City. Over powered with an unmatched hybrid of prototype military and civilian performance technologies, this top machine has been estimated to reach speeds of up to 205 MPH. The Batmobile’s imposing defense capabilities, supported by stolen Wayne Industries technologies, have been integrated with the latest in covert military grade armaments, stealth and active protection systems. 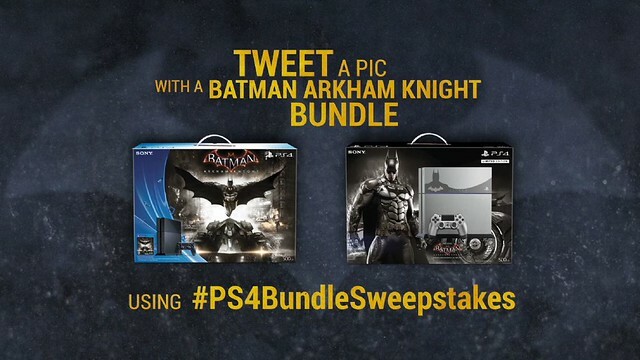 You have to have bought a Batman PS4 bundle, in order to take a pic and win a Batman PS4 bundle…. I know i cant be the only one to find this so messed up. 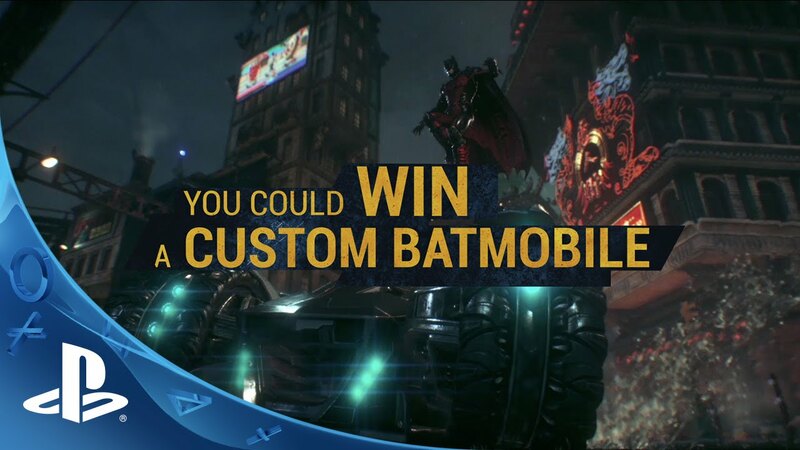 Why would i buy a PS4 Batman bundle to enter to win a PS4 Batman bundle? This should be open to everyone who bought the Batman game regardless if it was the PS4 bundle or just the game itself. You don’t need to actually BUY anything. Just go to Gamestop, grab a box and ask someone to take a picture of you looking like a winner…and tweet that. i enter and i hope i win!!! These guys couldnt even get the toy batmobile to be made correctly, why the hell would i think they could get a real one buit?